Nur 500 Meter bis zur Oper 50 Meter von dem Garten der Tuileries und 250 Meter von dem Louvre entfernt, 5 Minuten Spaziergang bis zur Seine, und den schönen Geschäften der 'rue St Honoré', finden Sie ein schön dekoriertes Studio im letzten Stock (mit Aufzug) eines typisch Pariser Wohnhauses. Es besteht aus einem Zimmer mit Schlafmöglichkeiten für 2 Personen. Ein schönes Bad und eine kleine eingebaute Küche stehen zur Verfügung. Das Studio ist hell, ruhig und mit allem modernen Komfort ausgestattet. Eine Waschmaschine, ein Mikrowellenofen, Computer mit DVD und kostenlose Internetanlage stehen zur Verfügung. Kostenlos ist auch das Telefon. Kinder sind herzlich willkommen! Just across the road from the Tuileries Metro station, with the Tuileries gardens, Rue St. Honore and Louvre within short walking distance. Perfect location as a base for seeing the sights of Paris. Well-stocked supermarket 1 1/2 blocks away, several reasonably-priced bistro-type restaurants nearby (Rue Markt St. Honore). Landlord was very friendly and uncomplicated. This converted attic is on 7th floor of a grand old building that has seen better days. There is a lift to the 6th floor, and a narrow steep staircase, partly without handrail, leads up to the flat. Despite being in the centre of town, it is extremely quiet. The rather old fridge was fairly loud though. Kitchen is well equipped. Lots of hot water for showering. Nice large bathtowels. View from the terrace was a bit disappointing - mainly chimneys, with the Eiffel tower in the background. (Standing on tiptoe one could also see the SacreCoeur). The flat was very clean. Lots of storage space. On the downside: This is definitely not a place for anyone with mobility problems. First there is the stairway to negotiate, then the bathtub is fairly high, and there is a high step to get out onto the terrace. Although the bed is comfortable, you have to enter it from the foot end. There is no proper table to eat from if the weather is not good enough to sit outside (we brought the bistro table and chairs from the terrace inside). We found the use of a PC as a substitute for TV not such a good solution, especially as we had our own notebook along. Free DSL was very useful. All in all - a functionally furnished, clean, well-equipped flat in a very good location, but without any trimmings. Suitable for anyone who puts convenience before luxury. Definitely not suitable for elderly or infirm, or for people with young children. Adequate for two people, would not recommend for more. Cannot say whether it is value for money due to lack of any sort of comparison. In view of Paris prices it probably is. Would probably come back and would recommend it to friends who are not too fancy after warning them of the shortcomings. 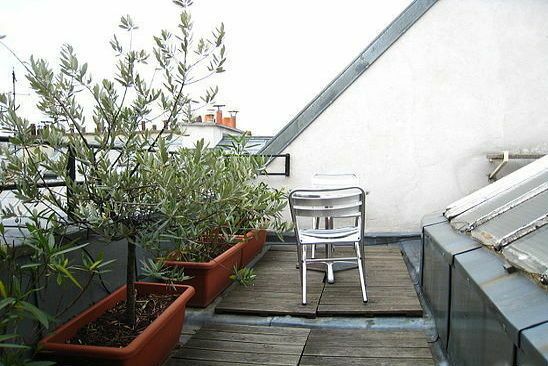 Superbe appartement pour 2 personnes à proximité de plusieurs stations de métro (Tuileries, Concorde, Pyramides) et de plusieurs restaurants sympas. Accueil par le propriétaire dès notre arrivée. Appartement très propre. Mon premier choix lorsque je retournerai à Paris.